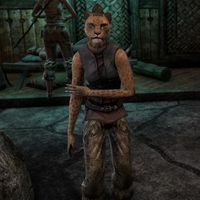 Igarri is a defiant Khajiit found inside the chapel in the city of Bruma. Lassen Dorvayn saved her on the night of the invasion. "When the Empire was strong, the madness that has overcome Bruma would not have been possible." "This one thanks you for your concern, but there are others worse off. It is right that Hjorik tends to the seriously wounded first. A Khajiit learns to bear wounds with courage, until the insult can be returned a thousandfold upon one's enemies." "This one will survive. Soon, our foes will discover that not all in Bruma have been declared." This page was last modified on 21 April 2019, at 10:33.